Nowadays, for the successful career of any Biomedical Sciences professional, it is essential to be able to handle complex circumstances while at the same time applying the knowledge and skills acquired during training time. It presents knowledge in a coherent and holistic way focused on biomedical professionals. It facilitates inclusive learning of concepts which, otherwise, are considered unnecessary for the training of these professionals. It is a process that fosters flexible understanding of difficult concepts adapted to solve problems. An integrated curriculum is student-centered: each student can learn at a different pace, but in a framework of continuous learning, while linking the importance of basic biomedical sciences with the clinical scenarios that will be faced as a future health professional. Different curricular initiatives have emerged in recent years, including: integrated courses; teaching focused on the patient through clinical presentations on a case; learning methods based on small groups, where the student is a protagonist; and a clear commitment to the use of technology. The way in which information is presented in this model forces the students to elaborate a type of knowledge based on their own experience (experiential learning). At the same time, students learn conciseness and precision in the organization of their ideas, skills that help them effectively resolve clinical cases. In addition, this model reinforces the fundamental role of learning basic sciences in the development of values such as discipline and rigor in the formation of students' thinking, logical reasoning, critical evaluation, problem solving, decision making, and creativity. If an institution is going to opt for an integrated curriculum, it must decide which type of integration best fits its objectives. Horizontal integration involves several courses, mostly simultaneous and usually within a single academic year. This type of integration is the one that best adapts to university courses in Biomedical Sciences within the disciplinary knowledge characteristic of basic sciences (Figure 1). Vertical integration, on the other hand, is built over time (in different academic years) and aims to close the gap between basic and clinical courses. Vertical integration can be implemented following a "Z or spiral model", where basic science courses are taught with the collaboration of clinicians. Hence, students begin their degrees focusing mainly (though not exclusively) on basic scientific principles, having clinical scenarios and case studies as a frequent routine in their education. This curricular style continues during subsequent academic years and concludes the degree with a year mainly containing clinical cases, but also reviewing basic principles. In this respect, a vertical integration approach must be bidirectional and focused on the importance of basic sciences in higher education courses where students acquire specialized training. Also, vertical integration has been associated with greater student motivation, positive perception of the learning process and better preparation of students for postgraduate education. Horizontal and vertical integration of disciplines seeks, in short, to train clinical professionals in the relevance of basic disciplines, so that they are capable of developing and modifying protocols in response to changing conditions and needs. That is, professionals with well-developed learning and clinical skills, but at the same time with a practical knowledge of the foundations, concepts and principles that enable them to evaluate initial evidence, reason effectively, incorporate new information, and, ultimately, make the best decisions. Finding appropriate methodologies for integrated learning is not easy, which has often led teachers to choose the best aspects of each and adapt them to their particular situation. IBL (Inquiry Based Learning, also known as “challenge-based learning”). Case-based learning (CBL) has been widely applied in Business Schools and Medical Schools, due to the availability of clinical cases for student learning. Its main limitations are that it is limited to small groups and requires a large number of instructors. Team-based learning (TBL) and inquiry-based learning (IBL) have different advantages, such as being easily applicable in large groups and requiring fewer teachers, which could be a significant factor in some degrees. TBL and PBL, as well as IBL, have been applied successfully in the first two years of university degrees. On the other hand, CBL has been used mainly for the latter years, since it requires students to have received a previous grounding in basic knowledge. Recently, two new methodologies have been proposed as highly suitable for use in the classroom when the objective is to establish integrated learning programs. These two methodologies, although less widespread, aim to combine some of the advantages of those described above, and can be scaled depending on the size of the group. • Ph-BL (Phenomenon Based Learning). Although its application in the classroom can be similar to PBL, its conceptual framework is different, since what is covered is a concrete phenomenon or fact that has to be real, not theoretical. Examples of such phenomena may be a line of research or a recent scientific discovery. Phenomenon-based learning has recently been proposed as a priority teaching model in the Finnish education system. According to the authors who made this proposal, this model stimulates curiosity, self-motivation, autonomy and observation to find a holistic or integrated explanation of a phenomenon that deals with a real problem. • WSLA (Work Station Learning Activities) is a flexible and scalable instrument to integrate successfully throughout the curriculum, and adapt to different levels and types of integration. This methodology has been expressly designed for integrated learning applied to pre-clinical courses in Health Science degrees. It presents some advantages similar to those of TBL, as it can be applied to large groups with a minimal number of instructors. The WSLA model has been created in our department of the School of Biomedical and Health Sciences at Universidad Europea de Madrid. Our reality has led us to develop this new methodology that we consider especially appropriate for implementing a progressive integration, without having to reach the curricular level of integration, but making use of the strengths of integrated learning. WSLA is based on creating work modules, following guidelines set by the European Higher Education Area and Spain’s National Agency for Quality Assessment and Accreditation (ANECA). WSLA serves to create integrated learning modules that can be applied and adapted to different situations, from master classes to gamification and practical laboratory sessions. In order to create the different modules of WSLA activities, teachers of different subjects select the learning objectives to be included. The different modules will constitute a certain percentage of the integrated curriculum, which should be at least 15% of the program. The model adjusts the creation of these modules to a horizontal or vertical integration scheme, depending on how learning objectives are set. With the selected objectives, the activity is designed to be suitable for presentation in a clinical or research scenario. WSLA Dynamics, organized in work stations, is compatible with other learning methodologies, such as case-based learning or inquiry-based learning, since it is flexible and adaptable to specific curricular needs. On the other hand, it is important to highlight certain limitations of new active methodologies involved in the development of integrated curricula. An institutional commitment is necessary for planning and coordination, both from a human resources point of view (in which different actors, with different interests and perspectives, come into play), and in terms of the infrastructures and scenarios for teaching (which have to be adapted). In addition, there are always teachers and students who do not adapt to the new approach. For example, teachers who prefer to use classical teaching methods and students who, having experienced the new active methodologies which involve a greater effort from the beginning, do not adopt the paradigm and tend to feel that they have acquired less knowledge. In this regard, evaluation must be formative as well as summative (after integration). It must offer immediate feedback and be objective, feasible, motivating, and accompanied by an improvement plan. As in any process of change, all these factors must be taken into consideration, but the need for gradual integration in Bioscience degrees is beyond doubt, if the goal is to ensure the student’s acquisition of competencies. Nowadays, integrated learning cannot be conceived of without the use of new technologies. Thanks to recent technological developments, it is possible to design competency-based integrated curricula focused on student training in the various Biomedical Sciences degrees. This generation of students will be the first to have grown up with the technology of interactive graphic applications, and they will perform their daily professional routines using augmented reality, mobile devices, virtual games, and learning analytics that will constantly measure the success of new learning environments. Mobile learning allows students to access content anywhere and through multiple contexts, using a variety of devices. These are mainly mobile phones and tablets, replacing in some cases traditional printed material, such as books. This way of learning is more informal but much more continuous. Masters et al. 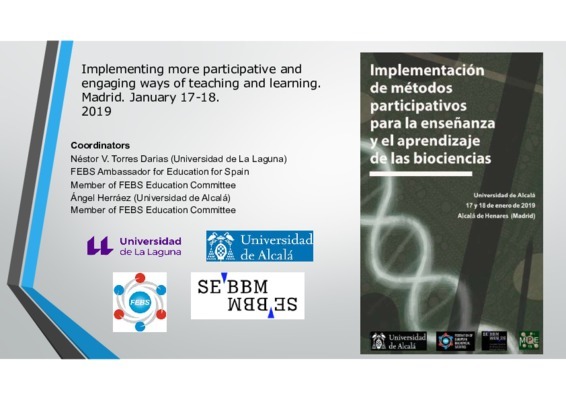 propose four interconnected domains and explain the applicability of mobile device use to learning in the Health Sciences. These domains would be: practice facilitated by mobile use; learning through mobile device; education/training through mobile device; and daily use of mobile device (Figure 2). These four domains are important in integrated learning, since learning objectives are presented to the student in different scenarios as realities of permanent relevance to their future as practicing professionals. Studies carried out to date on the impact of mobile learning on student performance are generally positive, although most of them have focused on students in the first two years of science degrees. The greatest advantage of mobile learning is the use of resources that facilitate continued collaboration of the teacher with students or of students with each other. Especially in Bioscience degrees with a high proportion of integrated clinical content, use of virtual and augmented reality technologies is very important. Thanks to these technologies, clinical scenarios that serve to achieve learning objectives related to basic sciences can be simulated. These virtual scenarios reinforce very well the theoretical content that is being worked on during the activity and allow the student to be aware of their own learning in a much more immediate way. In addition, in the context of applying basic sciences to clinics, virtual scenarios make it possible to recreate situations and decisions that are difficult to reproduce by other means, helping students learn to make better decisions and more accurate diagnoses. Integration of basic sciences into Biomedical Sciences curricula is essential, because it enables effective links to be established between understanding scientific foundations and clinical practice. Our challenge is to show that our strategies for integrating basic and clinical sciences lead to an optimal learning experience for our students. In this paper we have tried to summarize key points of integrated learning in the Biosciences field. We propose different learning methodologies enmeshed with new technologies that allow a model of integrated learning to be applied in the classroom. Associate Professor of Biochemistry and Molecular Biology. Research Group on Medical Education. Associate Professor of Molecular Genetics. Associate Professor of Embryology and Developmental Biology. Integration of basic sciences in health's courses. 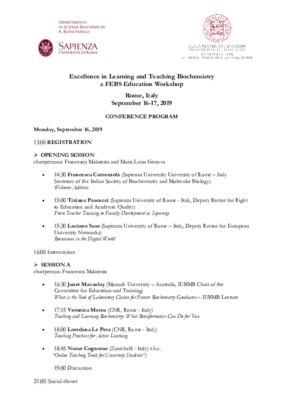 Biochemistry and Molecular Biology Education 40, 204-208. The integrated curriculum in medical education: AMEE Guide No. 96. Medical Teacher 37, 312-322. Flexner revisited: the role and value of the basic sciences in medical education. Academic Medicine 85, 349-355. Work station learning activities: a flexible and scalable instrument for integrating across basic subjects in biomedical education. BMC Medical Education 17, 236. 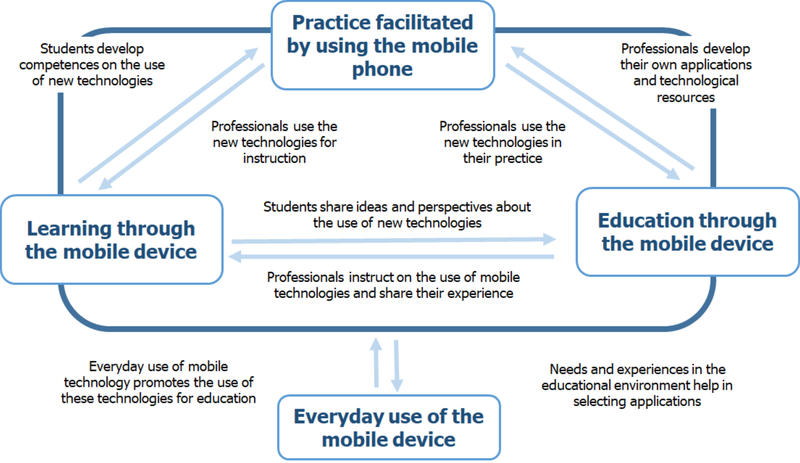 Mobile technologies in medical education: AMEE Guide No. 105. Medical teacher 38, 537-549. Liderando el cambio: hacia un currículo integrado para ciencias biomédicas. Experiencia de la Universidad Europea de Madrid. FEM: Revista de la Fundación Educación Médica 21, 215-222.